We are happy to announce a Retrospective of BCP activities since its inception two years ago. Through the Looking Glass will be on display at Samuha from February 20 to March 3, 2010. Inauguration: February 20th, 7.00 p.m. 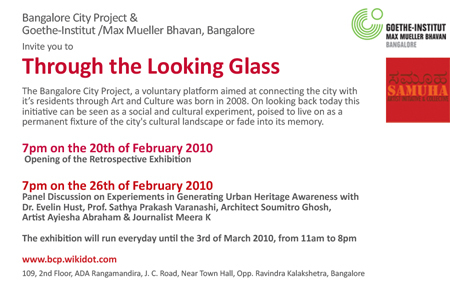 The Bangalore City Project comprises a group of concerned citizens from different fields, including art, culture, urban planning and architecture, as well as various organisations such as the Goethe-Institut/Max Mueller Bhavan, UDBHAVA Forum, 1 ShantiRoad, INTACH, Rainwater Harvesting Club, Samuha, National Institute for Geographical Studies, etc. It aims to create awareness about art and culture in the City of Bangalore, by initiating discussions and programmes on a neutral platform - to publicise the importance of cultural infrastructure, as well as the history and importance of various places in the city that remain silent and veiled. One of the objectives is to help create a unique identity for the City, a concept that will bear special significance for the future, as Bangalore grows in manifold directions and on manifold levels. On looking back it can be seen as a social and cultural experiment, currently either poised to become a permanent fixture on the city's cultural landscape or destined to occupy a venerable place in the archives. A Panel Discussion on 26th Feb 2010 at 7pm led by Dr. Evelin Hust, Director, MMB, Ar. Soumitro Ghosh, Ar. Prof. Sathya Prakash Varanasi, Artist Ayeisha Abraham, Editor Citzen Matters Meera K and Mr Varadarajan Seshamani. The opening on 20th night was fairly well attended with a crowd of about 40 people. The exhibition included a dozen panels, one dedicated to each BCP event over the last two years. Each panel contained a quote by an organiser / participant, a para on the area's significance, some pics of the event and a small note on things to do in the area. Besides this, there was a projection of the short film 'Through the Looking Glass' by Archana and Krupa, narrating the BCP story from the view point of its various stakeholders, Sathya and Evelin as initiators, Pankaj and Maureen as organisers, Merlyn & Paul D Souza and Dr Vasantasree & Mr Ramabhadra, neigbourhood hosts and Rajeswari S, event participant. There was also a projection of the photographs taken by different individuals over the various events. The feedback on the show was positive. The Panel Discussion on the 26th was well attended with over 60 people as the audience. The panelists presented their viewpoints on the role of experiments like BCP in generating public awareness. The audience was pretty vocal in stating that efforts like the BCP should and must continue. The question however still remains, how is BCP to be made sustainable? and what direction should it take? This Exhibition was put together by Krupa Rajangam and Archana Prasad with the kind support of Goethe Institut, Bangalore.